Gift basket inspirations. Of if you don’t want to make them, just buy them ready-made. When it comes to choosing a gift for someone on Christmas, you might hit a roadblock because you aren’t sure what the person would like. 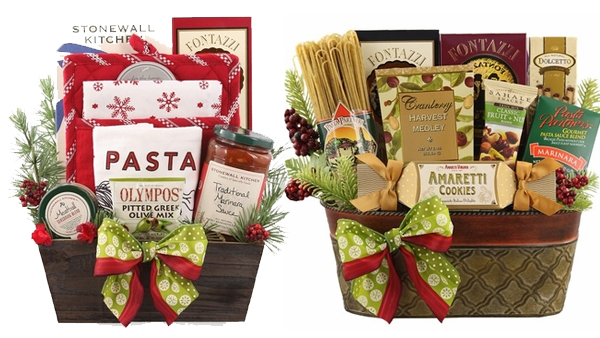 Christmas food gift baskets are ideal for those who seem to have a little bit of everything or for those who are simply to hard to shop for because they can be somewhat picky. The baskets are easy to make, and you can add just about anything to them that you think the recipient would enjoy. It’s best to find the basket that you’re going to use first. It should be a basket that reflects the holiday season and that is easy to decorate with ribbons and other Christmas items. You can add shreds of paper or tissue paper to the bottom of the basket as a base for the items that you are going to add. A chef’s basket is ideal for someone who is in the kitchen all the time and likes to add flavor to dishes that are made. Outfit the basket with everything that would be needed in the kitchen, such as spices, tools and small gadgets that the chef might not have or that might be worn. Bakers often use quite a bit of spices and liquid flavors with the cakes, cupcakes and other items that are created in the kitchen. An idea would be to add flour, cake mixes and other dry ingredients on the bottom of the basket with measuring cups, spoons and decorating tools to the top. Someone who likes to entertain would possibly enjoy a basket with dry dessert ideas. You could also include a bottle of wine or various kinds of coffee so that the person has a few options when it comes to beverages at the event. Meanwhile, a breakfast basket is ideal for someone who loves getting up in the morning to enjoy a pastry or a hot cup of coffee. Add a few mugs, coffee filters, different kinds of coffee, and foods that can be enjoyed for breakfast. This is one of the easier baskets to complete as there are several items to choose from, such as muffin mixes, donuts, or even just pancake mixes.